You can manage the sensors in the device and receive data from them. Using the Tizen.Sensor namespace, you can create sensor instances, which correspond to physical or software-defined sensor devices. The sensor instance is used to check the availability of and control the corresponding sensor. After you have created a sensor instance for a specific sensor and subscribed to sensor events, you can monitor the device's internal sensors for sensor value changes. The application can receive the sensor data only when the data is modified. When running an application on the emulator, you can use the Emulator Control Panel to simulate sensor data for the application. A device can have various physical and virtual sensors. The following table lists the sensors supported by Tizen. Note Not all devices support all sensors, so each sensor is not necessarily available on all devices. You can check whether a sensor is supported. For a specific supported sensor type, a device can have multiple sensors. /// Accelerometer is not supported in the current device. The event handler starts to be called at least once per the given interval. You can start multiple sensors of the same type with different intervals. In this case, the shortest interval is chosen. Some sensors are event-driven, meaning that they emit sensor events only if their data changes. For example, the proximity sensor emits its data only if the proximity value actually changes. For event-driven sensors, the update interval is ignored. The above example changes the update interval of the sensor to 200 ms.
You can change the power-save behavior of the sensor. The above example makes the sensor listen for the sensor data regardless of the display state and the power-save mode. However, it does not prevent the device from going to sleep mode. To listen for the sensor data, the device must be awake. The accelerometer measures changes in the velocity of a device. It is a combination of gravity and linear acceleration components. The accelerometer measures the device's accelerometer vector in 3 axes relative to its body frame. An acceleration of 1g always exists on the axis aligned to Earth's gravity. If the device is at rest, the sensor data reads 1g (the gravity offset) on one of the device axes and tells you which device axis is aligned to the direction of gravity. 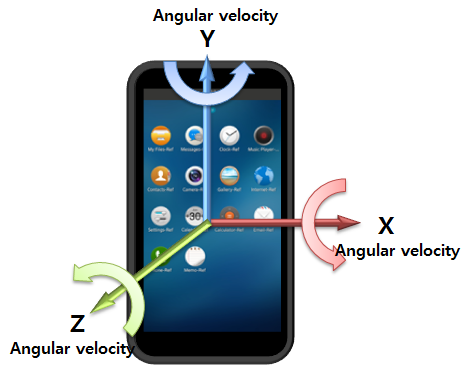 A falling device which has reached terminal velocity ideally shows the accelerometer value of 0 on all axes. The change in the effect of Earth's gravity is observed on the 3 device axes by rotating the device along any of the 3 axes. The linear acceleration components which correspond to the measure of the linear motion subjected on the device can be obtained by removing the gravity components from the accelerometer data. 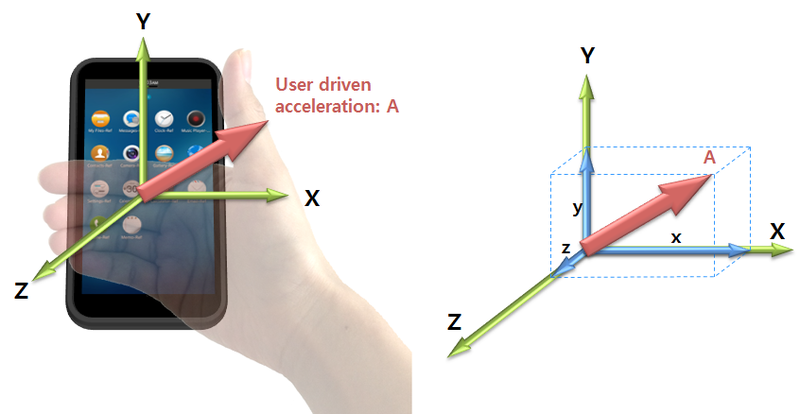 The accelerometer provides 3 components of acceleration (X, Y, and Z), as the following figure illustrates. The accelerometer outputs 4 values: 3 Cartesian axis values and a timespan. The accelerometer sensor measures and returns the axes' values in "m/s2" (meters per second squared). When a device is moved in the ±X, ±Y, or ±Z direction, the corresponding output increases (+) or decreases (-). The following table lists the measurement data that the accelerometer provides. The following table provides information about the accelerometer output for a device at rest. The geomagnetic rotation vector sensor is the output of a software/hardware-based sensor fusion solution which uses the accelerometer and magnetic sensors to compute the orientation of the device. In this sensor, the computed orientation is free of any drift, but it is inaccurate compared to a sensor fusion solution using the gyroscope sensor. 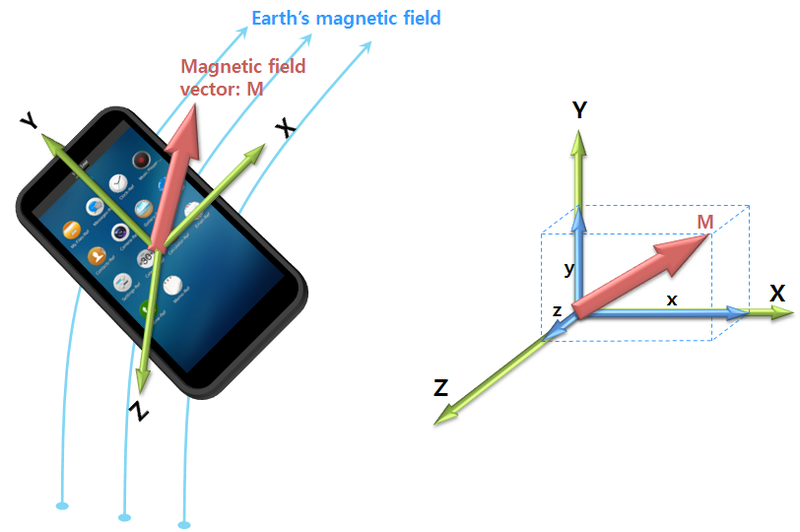 The geomagnetic rotation vector sensor represents the orientation of the device as a combination of an angle and an axis on which the device has rotated through a specific angle around an axis (X, Y, or Z). The following table lists the measurement data that the geomagnetic rotation vector sensor provides. The gravity sensor is a virtual sensor derived from the 3-axis acceleration sensor. 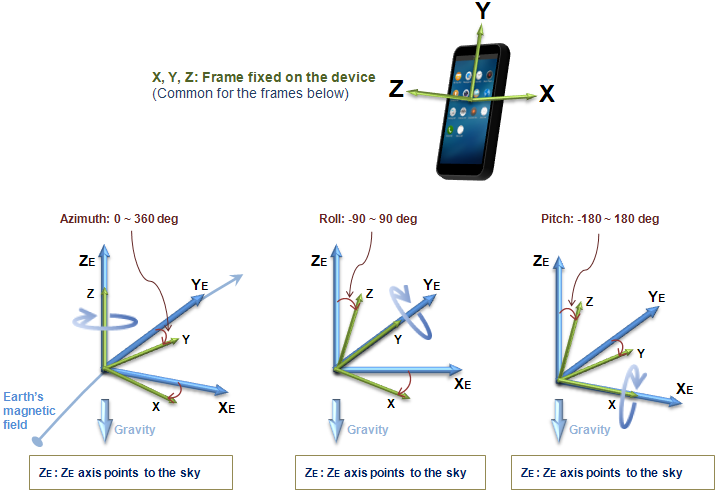 The 3-axis gravity components provide a measure of the effect of Earth's gravity observed on the device reference axes. The gravity components measured on a device vary based on changes in the device orientation, and hence they provide a measure of the rotation to which the device is subjected. The gravity sensor outputs 4 values: 3 Cartesian axis values and a timespan. The gravity sensor measures and returns axes values in "m/s2" (meters per second squared). When a device is rotated in the ±X, ±Y, or ±Z direction, the corresponding output increases (+) or decreases (-). The following table lists the measurement data that the gravity sensor provides. The gyroscope detects angular velocity or angular rates of a device. 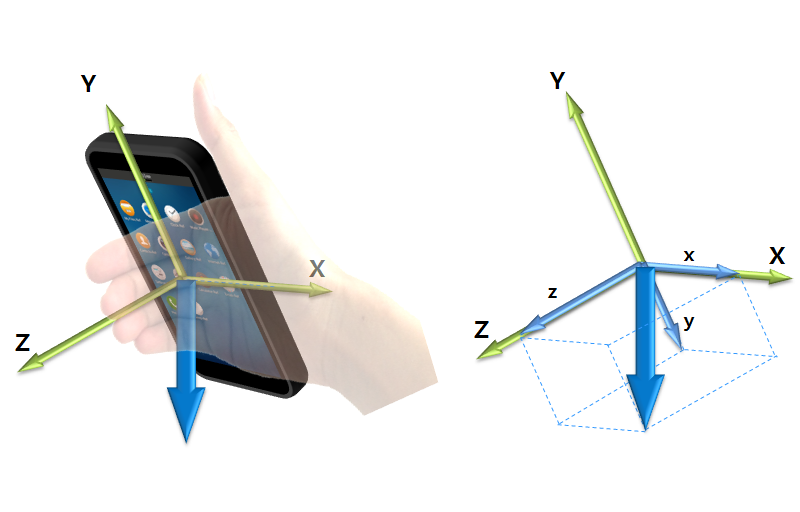 The 3D gyroscope data is considered to be very sensitive in detecting incremental rotation angles. The rotation angles obtained by integrating the angular rates over longer duration is inaccurate due to the build-up of drift. The following table lists the measurement data that the gyroscope provides. The gyroscope rotation vector sensor is the output of a software/hardware-based sensor fusion solution which uses the accelerometer and gyroscope to compute the orientation of the device. In this sensor, the pitch and roll equivalent representations are free of drift while the azimuth equivalent component is allowed to drift due to the absence of the magnetic sensor. The gyroscope rotation vector sensor represents the orientation of the device as a combination of an angle and an axis on which the device has rotated through a specific angle around an axis (X, Y, or Z). The following table lists the measurement data that the gyroscope rotation vector sensor provides. The Heart Rate Monitor (HRM) sensor measures a person's heart rate in real time. The following table lists the measurement data that the HRM sensor provides. The humidity sensor measures the relative ambient air humidity in percentage. The following table lists the measurement data that the humidity sensor provides. The light sensor detects the brightness of ambient light. It can be used to measure the brightness level. As an example use case, the light sensor can be used to control the brightness of the screen. In a dark environment, the light sensor detects the brightness of the environment and can be used to increase the device screen backlight brightness level. In a brighter environment, the backlight brightness level is lowered to save battery power. The following table lists the measurement data that the light sensor provides. 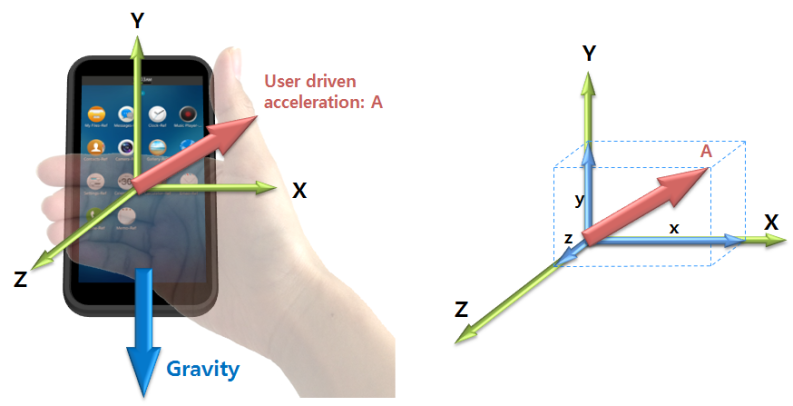 The linear acceleration sensor is derived from the accelerometer by excluding the gravity value, and it measures the user-driven changes in the velocity. The linear acceleration sensor is used to detect the dynamic movement of the device and analyze the user's motion profile. The 3-axis linear acceleration components provide a measure of the combined linear motion subjected to the device in Euclidean space. The linear acceleration sensor provides 3 components of acceleration (X, Y, and Z), as the following figure illustrates. The linear acceleration sensor outputs 4 values: 3 Cartesian axis values and a timespan. The linear acceleration sensor measures and returns axes values in "m/s2" (meters per second squared). When a device is accelerated in the ±X, ±Y, or ±Z direction, the corresponding output increases (+) or decreases (-). The acceleration output is shown in the same direction as the user-driven force. The following table lists the measurement data that the linear acceleration sensor provides. The magnetic sensor is a 3-axis electronic compass (sometimes referred to as a "magnetometer" or "geomagnetic sensor"). It can also be used in determining the azimuth component of the device orientation provided that the tilt of the device is already computed. The magnetic sensor measures the Earth's magnetic field strength and fluctuations, and splits the measurement into X, Y, and Z components. The following table lists the measurement data that the magnetic sensor provides. The magnetic sensor uses the 3-axis Cartesian space coordinate system, as the following figure illustrates. The following table lists the measurement data that the orientation sensor provides. The angular positions are measured using a fixed frame reference (XE, YE, ZE). The pedometer detects the user's steps, and returns the number of steps taken by the user since the last reboot, while at least 1 application is using the pedometer. The timestamp of the event denotes the time when the last step was taken. In addition to the number of steps, it also returns other tracking data to further describe the user's activity status. For example, it provides the user's moving distance and burned calories. All the values are reset to zero when the system reboots. Normally, an event handler is invoked whenever a new step is detected. However, to be power-efficient, the sensor can internally accumulate its detected events while the system sleeps. In this case, the accumulated data is reported when the system wakes up, that is, the display is switched on. In addition, even though the display is not switched on explicitly, the sensor can wake up the device to deliver its accumulated data occasionally. If you want to track the user's steps continuously, do not stop the sensor, to ensure it keeps running. If there is no application listening to the sensor, it stops counting the steps. The following table lists the measurement data that the pedometer provides. The LastStepStatus property is one of the values of the Tizen.Sensor.PedometerState enumeration: Unknown, Stop, Walk, or Run. The pressure sensor measures the atmospheric pressure in the device's surrounding environment. The following table lists the measurement data that the pressure sensor provides. The proximity sensor detects the presence of nearby objects in close proximity to the sensor. It can be used to measure the distance between nearby objects and the device. As an example use case, the proximity sensor can be used to lock or unlock the device screen. When the device user holds the device to their ear, the proximity sensor detects the user as an object, and automatically locks the device screen. When the user moves the device away from their ear to input data, the proximity sensor determines that there are no nearby objects, and unlocks the screen. The following table lists the measurement data that the proximity sensor provides. The ProximitySensorState property is one of the values of the Tizen.Sensor.ProximitySensorState enumeration: Unknown, Far, or Near. The rotation vector sensor represents the orientation of the device as a combination of an angle and an axis, in which the device has rotated through a specific angle around an axis (X, Y, or Z). The rotation vector is the output of a software/hardware-based sensor fusion solution, which uses the accelerometer, gyroscope, and magnetic sensor as inputs to compute the orientation of the device. The following table lists the measurement data that the rotation vector sensor provides. The sleep monitor tracks the user's sleep quality. Once per minute, it reports whether the user sleeps. As this sensor usually needs to track the sleep quality over several hours, it must be power-efficient and work in a batch manner. While the system sleeps, or the display is off, the sensor keeps its detected data internally. When the sensor is unable to keep more data (its internal buffer is full), it wakes up the system and flushes all collected data. When flushing, the event handler is invoked repeatedly. The timestamp of each event can be used to figure out when the user was sleeping. The following table lists the measurement data that the sleep monitor provides. The SleepState property is one of the values of the Tizen.Sensor.SleepMonitorState enumeration: Unknown, Wake, or Sleep. Depending on the device you are using, the available raw sensors are different and the sleep detection algorithm can also vary. In addition to the sleep state field, some specific device models can provide further data, as defined by the model manufacturer. The temperature sensor measures the ambient room temperature in the device's surrounding environment. The following table lists the measurement data that the temperature sensor provides. The ultraviolet (UV) sensor measures the ultraviolet index. The sensor detects and provides a measure of the UV rays the device is exposed to. The following table lists the measurement data that the ultraviolet sensor provides. The uncalibrated gyroscope detects angular velocity or angular rates of a device. The 3D uncalibrated gyroscope sensor is considered to be very sensitive in detecting incremental rotation angles. The rotation angles obtained by integrating the angular rates over longer duration is inaccurate due to the build-up of drift. The uncalibrated gyroscope data also consists of drift compensation values for each axis, which can be used to subtract the drift from the detected angular rates. The values of drift for the 3 axes are obtained from the output of a software/hardware-based sensor fusion solution. The following table lists the measurement data that the uncalibrated gyroscope provides. The uncalibrated magnetic sensor is a 3-axis electronic compass (sometimes referred to as a "magnetometer" or "geomagnetic sensor"). It can also be used in determining the azimuth component of the device orientation provided that the tilt of the device is already computed. It measures the Earth's magnetic field strength and fluctuations, and splits the measurement into X, Y, and Z components. The uncalibrated magnetic sensor is similar in functionality to a magnetic sensor, but does not perform hard iron calibration. Factory calibration and temperature compensation are applied. The following table lists the measurement data that the uncalibrated magnetic sensor provides.